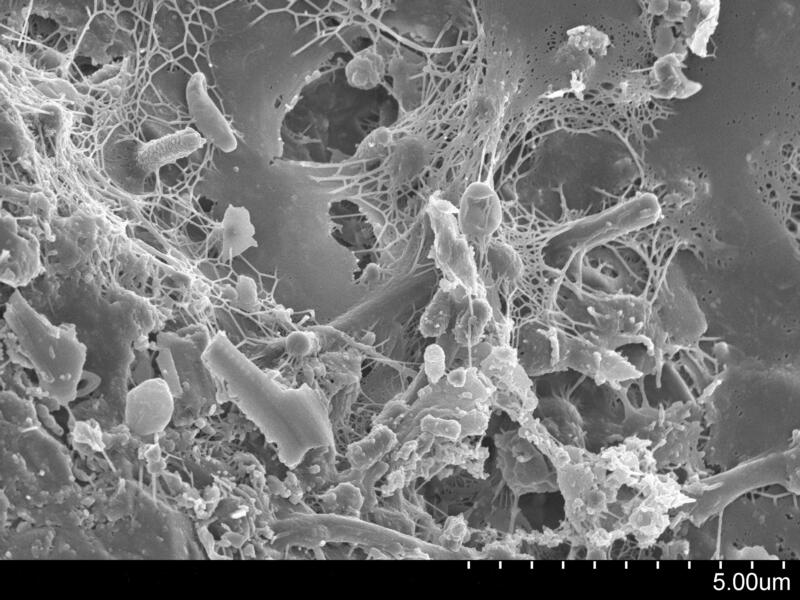 Anybody doubting that biofilms really do exist on dry hospital surfaces needs to read this study: biofilms are there, they are complex, and they are common. A landmark study by the same Australian Vickery group published in 2012 first identified biofilms on a handful of dry hospital surfaces in an ICU. But this study is far more comprehensive and convincing. The team cut samples of patient bedding (n = 11), patient surrounds (n = 19), and fixed furnishings (n = 14) from an ICU. Each sample was cultured using a conventional approach, tested for the presence of S. aureus by PCR, examined for the presence of biofilm under electron microscopy, 18 samples underwent a live/dead microscopy technique 12 months after sample collection, and 15 samples were pyrosequenced to evaluate their “environmentome”. Biofilm was detected on a whopping 41/44 (93%) of the samples. And all 18 of the samples evaluated using live/dead microscopy contained live bacteria 12 months after sample collection. Furthermore, MRSA was cultured from 18%, ESBL from 11% and VRE from 8% of the samples, and 50% of the samples gave a positive signal for S. aureus by PCR. I’m not certain what the PCR for S. aureus adds to the findings. It’s not possible to say whether this was viable S. aureus or a fragment of DNA detected from dead bacteria. A study that I did years ago suggested that PCR was not a good tool for environmental sampling for MRSA. The “environmentome” analysis is perhaps the most interesting aspect of the study. As you may expect, the diversity of bacteria identified in the biofilms was broad and environmental organisms that you probably haven’t heard of (even if you’re a microbiologist) predominated. For example, Faecalibacterium prausnitzii and Massilia timonae (had to copy and paste those) were the two most common organisms, followed by S. aureus and coag-neg staph. Perhaps surprisingly the floor biofilms were less diverse than the biofilms from the patient surrounds. 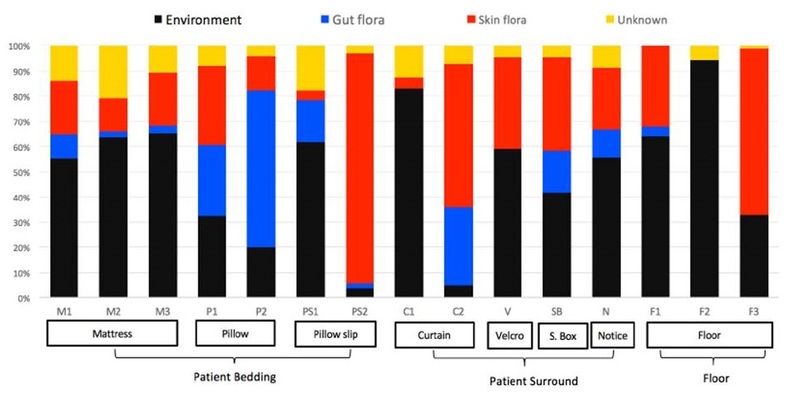 The figures (see below) are probably the most meaningful way to interpret the environmentome data, showing that the source of predominating bacteria (gut flora, environmental, skin flora or unknown) varied substantially by sample type, with environmental bacteria dominating mattresses and the floor, and gut / skin flora dominating pillows. (Although best not to think about why gut flora were so common on pillows…) Phylogenetically, there was clustering of the environmentome by specimen location, as you would expect, although the floor was so diverse that floor specimens did not cluster together. One interesting finding was that obligate anaerobes accounted for something like 50% of the bacterial species identified – from open surfaces in the ICU. This suggests that these obligate anaerobes were lurking deep in the anaerobic portions of the biofilms. Figure: Composition of biofilms by bacterial source. As if to illustrate the inadequacy of conventional methods in addressing these biofilms, a neat feature of the study was that the samples were collected immediately after two-step cleaning / disinfection, with a detergent clean followed by a bleach disinfection. It is no great surprise that conventional methods do not eliminate biofilms. We know that biofilms provide physical protection from cleaning and also make microbes considerably less susceptible to disinfects by a factor of 10-1000 fold! So what to do about biofilms on dry hospital surfaces? It seems likely that a daily light clean with existing products will do little more than feed and water these biofilms. We need new products and approaches designed specifically with biofilms in mind. But more importantly, the world needs to wake up to the fact that biofilms are present on dry hospital surfaces, and that this is a problem we need to address. No more can we consider the hospital environment (or any other environment for that matter) ‘inanimate’. It couldn’t be more ‘animate’. More animate in fact than our own bodies in terms of number of living cells! I’ve been aske to look at a new cleaning solution which is a combination of quats and claims to leave ‘an invisible barrier to protect surfaces from germs for up to 24 hours’. I’m already sceptical but is this type of product going to help or will it contribute to the biofilm?? (c) abrasion / wear in high touch zones can reduce efficacy in those areas, and so produce inconsistent performance over time. (d) they work best on softer surface materials, so for aluminium surfaces they are excellent; for hard stainless their ability to penetrate / bond at the molecular level is exponentially reduced because the molecular structure is tighter. This limits the effectiveness over time. The claim as to the effectiveness of such surface treatments being unaffected by “regular cleaners” is also a function of the pH of those cleaners. High pH quats will reduce the effectiveness of such treatments, and so reduce your stated effective life time of 12 months. If the initial treatment is done at the manufacturer’s site, that treatment has the greatest potential to be somewhat effective. However, when it comes to the time to re-treat, more often than not “on site”, there are lots of issues that arise. I only state all of this because of 6 yrs experience in that specific technology with a couple of manufacturers and seeing their effectiveness in the field over time. Pat, your skepticism is well founded. Well established Biofilms are unaffected by such quats, and here is the reason why; because the biofilm doesn’t allow the sanitizers / disinfectand such as quats to penetrate all the pathogen bacteria’s cell wall, the unaffected pathogens reform the biofilm, using the protein from the pathogens killed as their food source. What is not appreciated is that pathogen bacteria based biofilms can replicate every 20 minutes. In effect the leading chemical companies have a vested interest in pushing the ever more toxic, heavy duty bleaches and quats because that is their business; making chemicals. But we are seeing increasingly that chemicals on their own are: (a) proving to be less and less effective, and (b) are contributing to the ongoing mutation of pathogen bacteria into what we commonly refer to as “Super Bugs” like MRSA. Something has to change, and it is, thanks largely to the enormous research into the microbiome of buildings, the human gut and premise water systems. This research is opening up the door to what appears to be a truly revolutionary development in cleaning; that being the addition of Biology in the form of safe, healthy, “good” bacteria to the conventional combinations of Chemistry and Physics. Its the concept of “fighting fire with fire” .. using “good” bacteria to address “bad” / pathogen bacteria. There are a few products coming onto the market, some have been proven up in aggressive environments such as dairy and pig barns with great success. (And by great success I mean Independent 3rd PArty documentation of their ability to out perform conventional bleaches, quats and oxidizers in the eradication of MRSA, salmonella, e.coli, listeria et al). One important point; enzyme cleaners are not the same as these emerging Biology based cleaners; enzymes are proteins, not healthy, good bacteria. As such enzymes cease to function once the surface is dry, and given this article refers to te presence of biofilm on dry surfaces, enzymes would be short lived and so ineffective, especially relative to the Biology / Bacteria based cleaning agents. I know this is late, but I hope you get to read this and that it is helpful. What about stethoscopes? Seems to be the forgotten transmitter from patient to patient. Absolutely agree. Almost certainly bio films there too! OK .. I am “late to this party” and I hope there is still the option here for a dialogue. (3) Biofilms are an issue because they protect the very pathogens we are wanting to get rid of and are created by these same pathogens .. so in other words it could be stated that Biofilms are a Biological problem. So lets ask the core question .. are the current cleaning solutions of combining Physics (scrubbing, sweeping, vacuuming etc ) and Chemistry (the bleaches, quats and oxidizers ..) working? The answer is increasingly “NO”. Einstein’s definition of “Insanity” seems then most appropriate here given that the cleaning industry is repeating over and over again the same protocols, with essentially the same products and hoping for a better, different result. Well I think we need to wake up and smell the coffee and appreciate that this isn’t going to happen. What is needed is a totally different approach to cleaning, one that simulates / adopts the processes of natural Biology. There is a lot of interesting work being done in this field utilising the research being done on the areas of “using Bacteria to fight Bacteria” in ways that are based on the concepts of Competitive Exclusion and so are non-toxic and don’t contribute to the ongoing mutation of pathogens. Now don’t confuse Enzyme based cleaners as being such a solution – Enzymes are Proteins, not Biological entities, and they only work when the surface is wet; once dry they cease to function). Such an approach is not without its obstacles, as it is going to require a massive paradigm shift away from a centuries old approach of “Kill Everything” to recognising that we can use “good” (aka healthy / non-harmful) bacteria to overcome “bad” ( aka pathogen / harmful) bacteria and so replace pathogen bacteria with good ones, which is way more natural. The research into the microbiomes of facilities, the human body (especially the gut) and premise water systems is leading the way in developing such an understanding, and so such new approaches. The emerging introduction of Biology to the long standing, “ancient” cleaning protocols of just Chemical and Physics represents the most dramatic shift in Cleaning and so Health & Safety, and from all I have read, the adding of Biology in the form of “good” / safe, healthy bacteria also can address the issue raised here about the presence of Biofilm. Professor Karen Vickery from Sydney is one of the lead global researchers on dry surface biofilm. At the SHEA conference in St Louis this year Prof Vickery gave a really great presentation on the extensiveness and threat from these biofilms. She confirmed that products such as Bleach are not effective however data was presented which showed NaDCC tablets as having immediate ( 4 minute) and substantial ( 7 log) reductions of key biofilm pathogens. (There are numerous suppliers of NaDCC tablets in USA including, 3M, Sodexo, Unimed, Brulin, Earthsafe, Athea) .